South Korean President Moon Jae-in on Tuesday said that he "was not able to sleep last night" in anticipation of the historic meeting United States President Donald Trump and North Korean leader Kim Jong Un in Singapore. Speaking ahead of a weekly cabinet briefing, Moon added that he hoped that the North Korea-US summit would be a success and open a "new chapter" for establishing long-lasting peace on the Korean Peninsula. The South Korean president and his cabinet ministers delayed their weekly briefing for over 10 minutes to watch Trump and Kim meet face-to-face at the Capella Hotel in Singapore, where the two leaders shook hands and exchanged pleasantries, as they posed for photos in front of a row of US and North Korean flags. "The NK-U.S. summit has now begun. I think the Korean people's interest is all about the summit in Singapore. I, too, was not able to sleep last night. I look forward to working with people so that these will become successful talks that will open a new era of complete denuclearization, peace and inter-Korean and US relations," Moon said during the Cabinet meeting. However, Moon noted that a single summit would not be sufficient for a successful denuclearisation. "The deep-rooted hostile relationship and the North Korean nuclear issue cannot be resolved in one single action in a meeting between leaders. 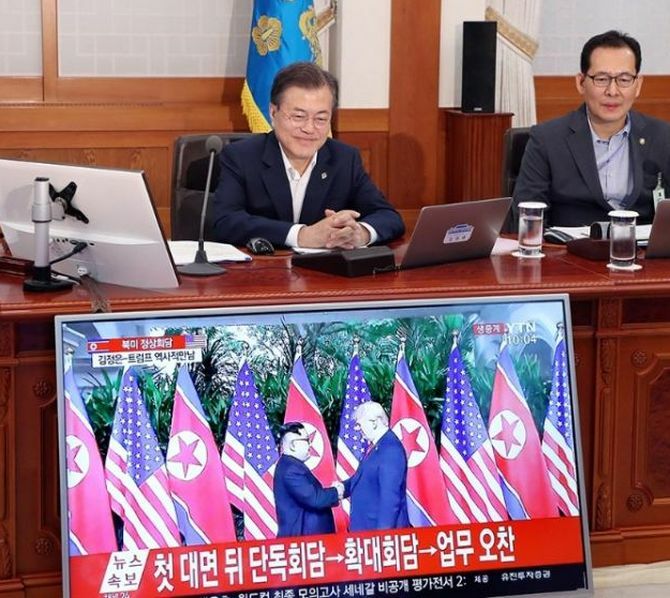 Even after the two leaders open the dialogue, we will need a long process that may take one year, two years or even longer to completely resolve the issues," Moon was quoted by Yonhap News Agency as saying. An official of the South Korean presidential office later said that US Secretary of State Mike Pompeo will visit South Korea on Wednesday to brief Moon on the outcome of the US-North Korea summit, as per the report. The South Korean president has expressed hope that he will hold a summit with Kim and Trump soon, in a bid to establish a permanent peace treaty to formally end the over six-decades-long Korean War. The two Koreas technically remain at war as the Korean War ended with an armistice agreement and not a peace treaty. Earlier, Moon in an unexpected telephonic conversation with Trump, expressed hope regarding the US-North Korea summit, saying a successful summit would be a birthday gift for the US president.